Jameson Brooks’s BOMB CITY and Micah Barber’s INTO THE WHO KNOWS! and James Gray’s THE LOST CITY OF Z.
Dallas, TX (February 13, 2017) – The Dallas Film Society today announced eleven official selections for the 11th edition of the Dallas International Film Festival. Featuring two world premieres (Jameson Brooks’s BOMB CITY and Micah Barber’s INTO THE WHO KNOWS! ), the selections are a sampling of several of the non-competitive programming sections that make up Texas’s largest film festival, as well as two films set for this year’s Texas Competition. Led by Stefon Avalos’s Slamdance Film Festival award-winner, STRAD STYLE, the list of titles represents DIFF’s long-standing tradition of programming films that have impressed elsewhere on the film festival circuit, such as François Ozon’s FRANTZ (Sundance), Sarah Adina Smith’s BUSTER’S MAL HEART (Toronto), and James Gray’s THE LOST CITY OF Z (NYFF). DIFF also announced the film festival will present the Studio Movie Grill Silver Heart Award to the film that best addresses Human Rights issues. A $5,000 cash prize will be presented by the Schultz Family during the Dallas Film Society Honors event presented by the Arthur E. Benjamin Foundation on Friday, April 7, as DIFF continues its decade-long tradition of looking beyond the artistic value of film to the impact on the community, either via environmental, or in this case, human rights issues, as well. The Silver Heart Award is bestowed on an individual or film for their dedication to fighting injustices and/or creating social change for the improvement of humanity. This year’s Texas Competition, presented by Panavision, which promotes the state’s impressive home-grown filmmaking talent by focusing on films produced and shot in Texas, includes the world premiere of Jameson Brooks’s drama BOMB CITY, about a controversial hate-crime that took place in a small, conservative Texas town. Also competing in the category is Jason Headley’s comedy A BAD IDEA GONE WRONG about two would-be thieves that bungle their way into a hostage situation during a poorly-planned break-in. The second announced world premiere selection, Micah Barber’s INTO THE WHO KNOWS! about a boy and his best friend, Felix the Fox, that escape summer camp to embark on a big mystical adventure, will make its debut as part of DIFF’s very popular Family Friendly section. Also screening will be Tony Shaff’s documentary 44 PAGES, which tells the surprising story of Highlights Magazine, and screens at DIFF immediately following its debut at SXSWedu in March. 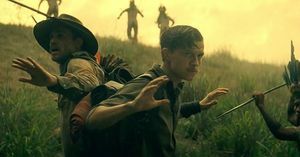 DIFF’s Premiere Series will include; Smith’s mind-bender BUSTER’S MAL HEART, which stars Mr. Robot’s Rami Malek as a mountain man drifter who had a life-changing run-in with a stranger obsessed with a conspiracy theory; Ozon’s drama FRANTZ, about a woman coming to terms with the death of her fiancé in World War I; and Gray’s true-life epic THE LOST CITY OF Z, which follows the tale of British explorer Col. Percival Fawcett, who disappeared in the Amazon in the 1920s. Avalos’s STRAD STYLE, which won both the Grand Jury Prize and the Audience Award for Best Documentary at the recently concluded Slamdance Film Festival, and Matt Schrader’s SCORE: A FILM MUSIC DOCUMENTARY, are the first two selections announced from DIFF’s beloved Deep Ellum Sounds section. The music-themed documentary section hails back to the film festival’s roots in the colorful music-infused neighborhood with the Deep Ellum Film Festival, which was the precursor to the Dallas International Film Festival. 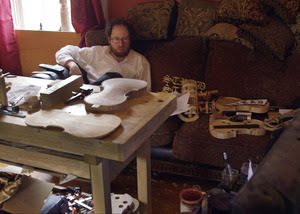 STRAD STYLE follows the efforts of a man in Ohio, who decides he can build a classic Stradivarius violin, and SCORE: A FILM MUSIC DOCUMENTARY, looks at the art of film scoring via interviews with nearly every prominent film composer on the scene today. Rounding out the first selections revealed to the public are Steve James’s ABACUS: TOO SMALL TO JAIL, about the only U.S. bank to face criminal charges in the wake of the 2008 financial crisis, and Alejandro Molina’s THE PRESENT ONES (Los Presentes), about an actress having identity issues after returning to play a character that gets under her skin just as she faces a relationship crisis. ABACUS: TOO SMALL TO JAIL will screen as part of DIFF’s Documentary Showcase, and marks the fourth of James’s films to be a part of the festival. THE PRESENT ONES is part of DIFF’s Latino Cinema Showcase. Once again, the Dallas Film Society has teamed up with DART for their successful partnership DART to DIFF. Many DIFF activities and events take place in the heart of Dallas and the partnership with DART will provide quick and convenient transportation for all festival attendees. Online ticket sales will be available for Dallas Film Society members beginning Monday, March 13 at DallasFilm.org, and will open to the public on Thursday, March 16. The physical Prekindle Box Office will open on Thursday, March 20. A BAD IDEA GONE WRONG is a comedy about two would-be thieves who accidentally arm the alarm system and have to break out of the house they just broke into. When they discover an unexpected house sitter, they suddenly have to deal with a hostage situation, double crosses, sexual tensions, and discoveries that make their difficult escape even more dubious. BOMB CITY is a gritty-drama, about the hatred and oppression of a group of punk revolutionaries in a conservative Texas town. Their ongoing battle with a rival clique leads to one of the most controversial hate crimes the U.S. has ever seen. Based on the true story of Brian Deneke. In this bold thriller spiked with dark humor, Rami Malek (Mr. Robot) is Buster, a family man whose chance encounter with a conspiracy-obsessed drifter leaves him on the run from the police and an impending event known as The Inversion. 44 PAGES is a portrait of Highlights Magazine following the creation of the cultural phenomenon's 70th Anniversary issue, from the first editorial meeting to its arrival in homes, and introducing the quirky people who passionately produce the monthly publication for "the world's most important people,"...children. Along the way, a rich and tragic history is revealed, the state of childhood, technology, and education is explored, and the future of print media is questioned. A haunting tale of love and reconciliation begins in a small town in Germany in the immediate aftermath of World War I when a young woman mourning the death of her fiancé encounters a mysterious Frenchman laying flowers on her beloved’s grave. Ten-year old Thomas has a best friend: Felix the Fox. But his parents want him to make “real friends”, so they send him to summer camp. However, he hates it, so he and Felix make a midnight escape. Deep in the forest of the Who Knows they pursue a mythical being called the Totem, and decide to catch it. Ana, a former actress, gets the chance to reunite herself with Ophelia, a character she played years ago on the stage, when she met and fell for the man who is her husband now. However, at this point in her life, her marriage is facing a difficult time, tenuously kept together is their 6-year old son. By playing the character, and “becoming” Ophelia once again, and under stressful circumstances, Ana suffers a personality split which leads her to an extreme and life changing juncture, something she has never faced before. SCORE: A FILM MUSIC DOCUMENTARY brings Hollywood's premiere composers together to give viewers a privileged look inside the musical challenges and creative secrecy of the world's most widely known music genre: the film score. STRAD STYLE follows a backwoods dreamer from Ohio with an obsession for 'Stradivari' and all things violin, who, through the magic of social-media, convinces a famous European concert violinist that he can make a copy of the most famous and valuable violin in the world. Fighting time, poverty, and most of all - himself - Danny Houck puts everything on the line for one shot at glory.